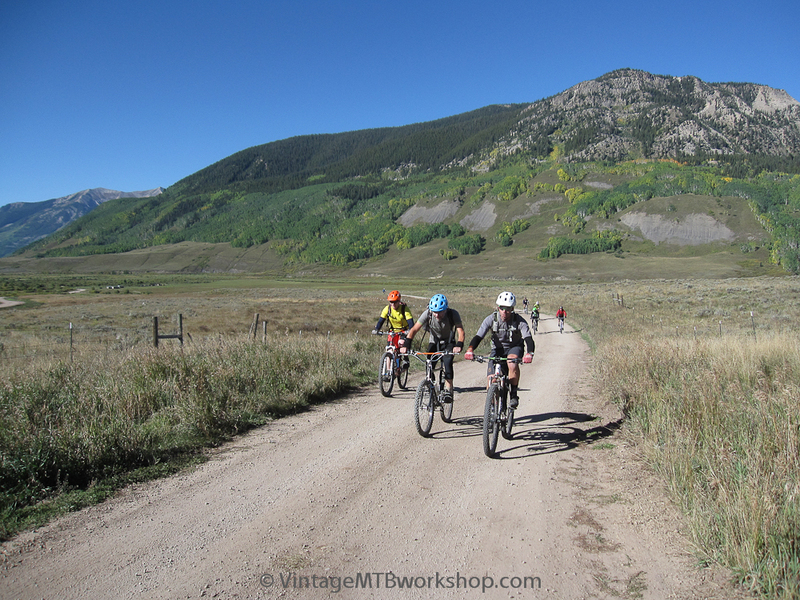 The 38th edition of the Pearl Pass Tour, a 39 mile ride from Crested Butte to Aspen, was held on Saturday, September 13, 2014. 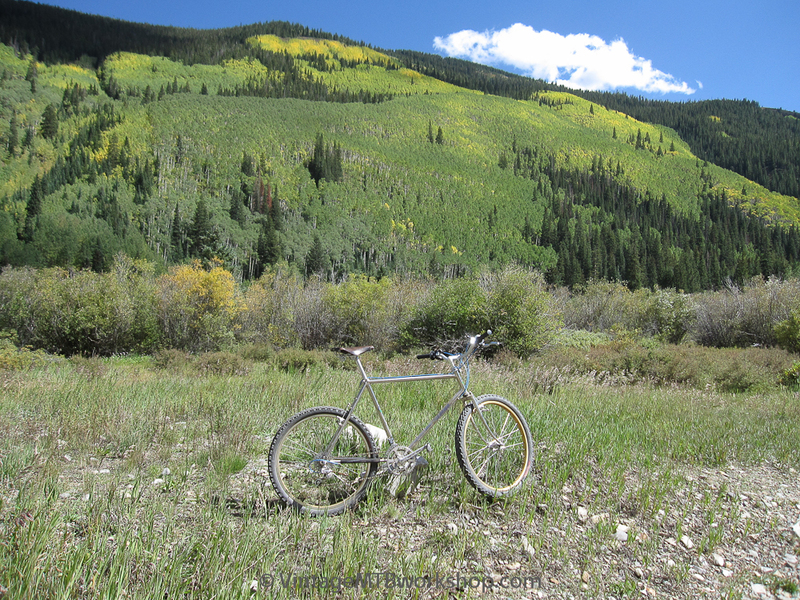 The weather was perfect, with the fall colors just starting to show. 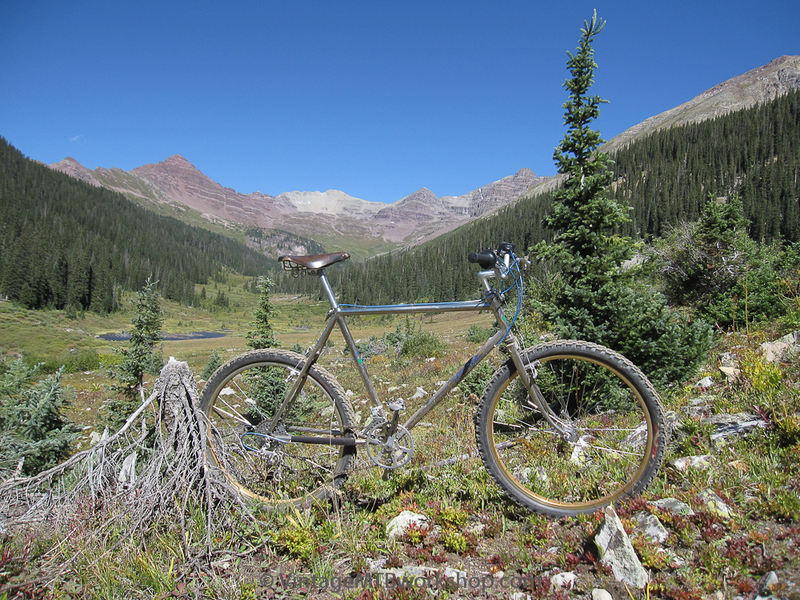 The goal of the ride this year was to carefully navigate a Series II Breezer built by Joe Breeze in 1980. 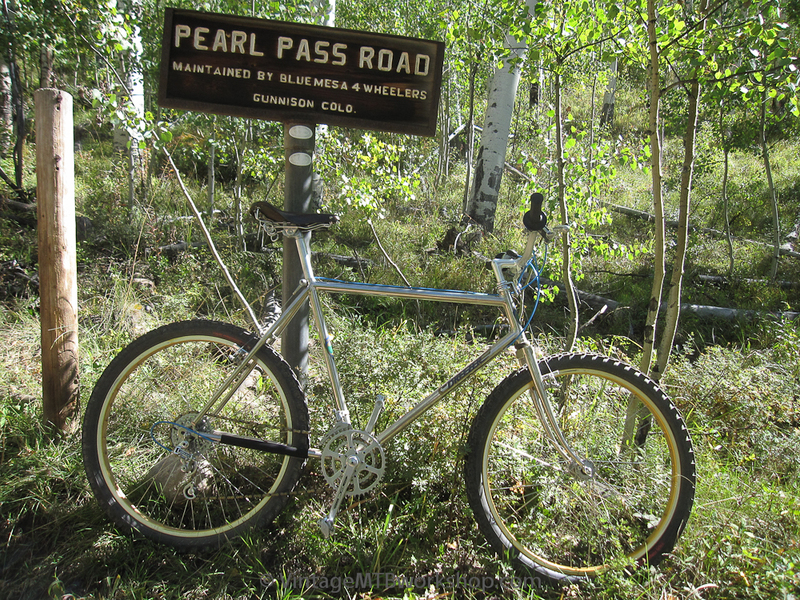 This bike was number 11 of 25 built in that Series, and had been used by the original owner to complete the Pearl Pass Tour in 1982. 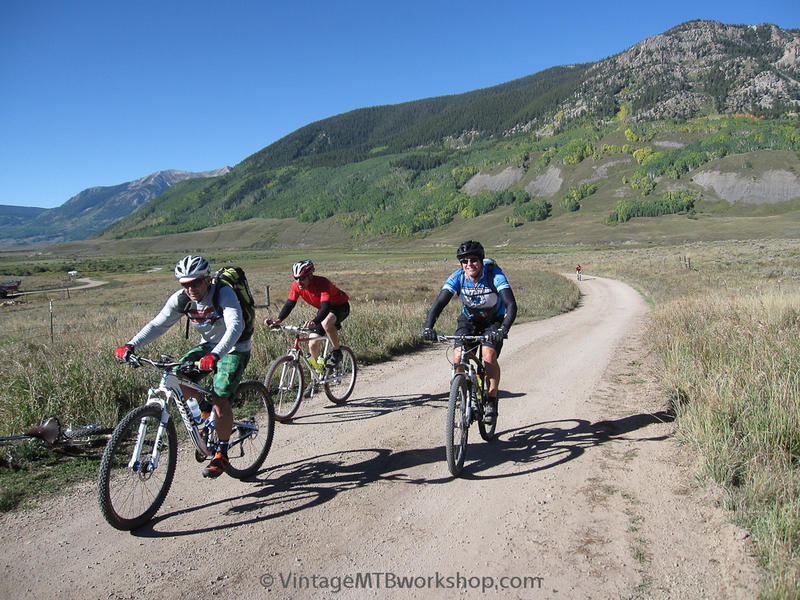 Returning the bike to the event some 32 years later felt historically significant. 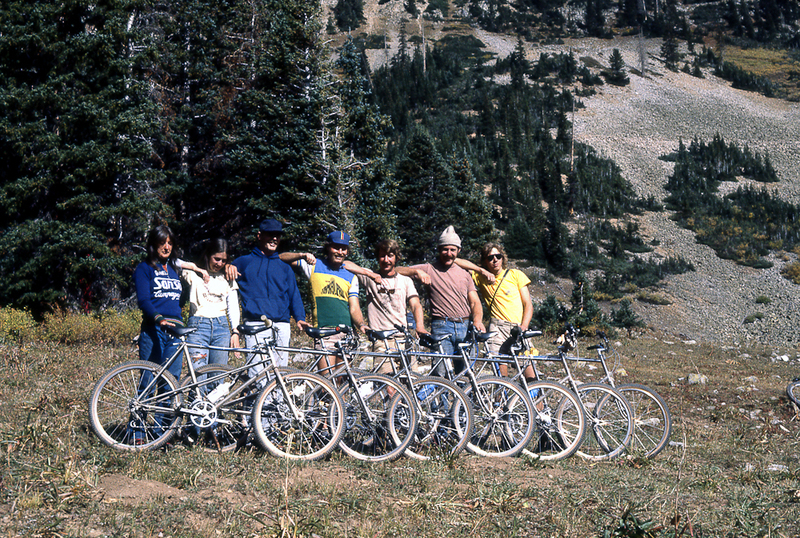 This photo by K. Montgomery shows a line up of Series I and Series II Breezers owned by the early pioneers of the sport at the Cumberland Basin camp during the 1980 edition of the Pearl Pass Tour. 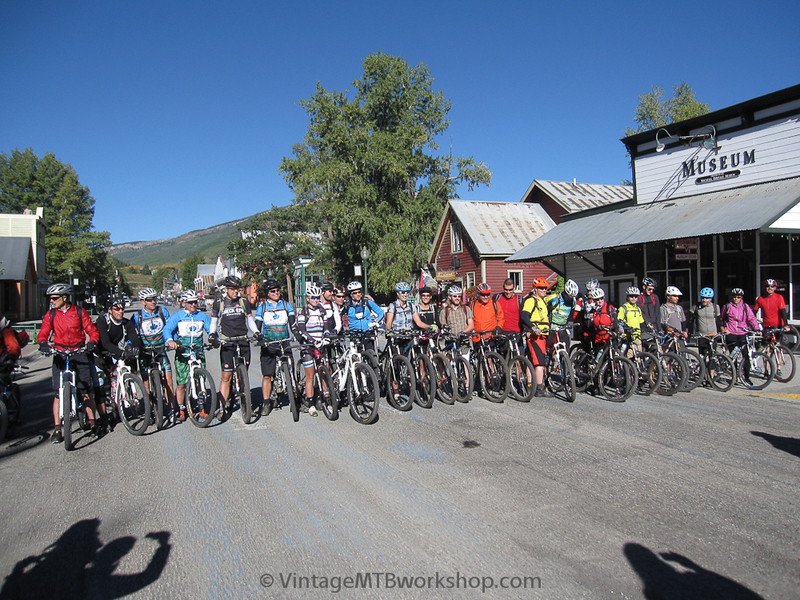 For 2014, the group gathered on Saturday morning in front of the Crested Butte Heritage Museum had nearly 30 eager participants. People came from both near and far this year, indicating that through social media this informal event might begin to grow in size. The previous morning a band of 8 intrepid klunker riders had taken off from this same spot to camp out and join the large group departing on Saturday. 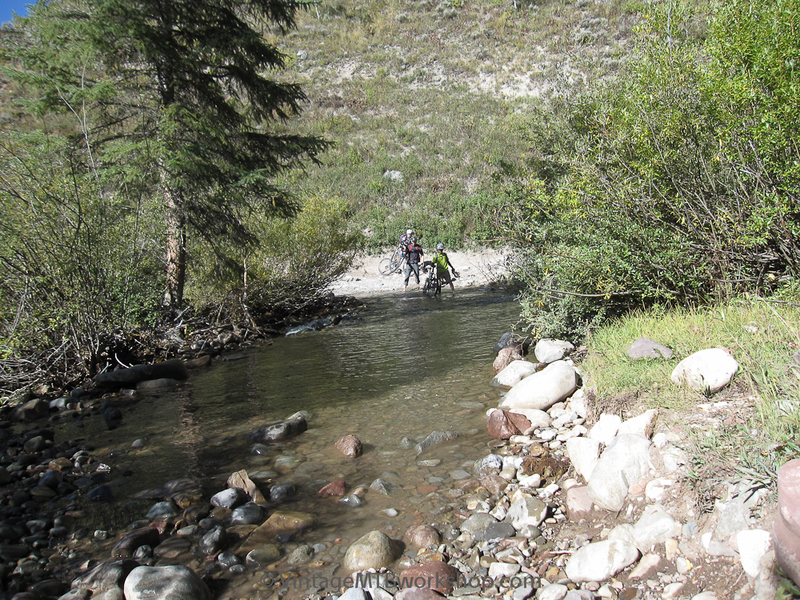 The group began to spread out as the climb up Brush Creek kicked in. The first crossing of Brush Creek saw unseasonably high water. 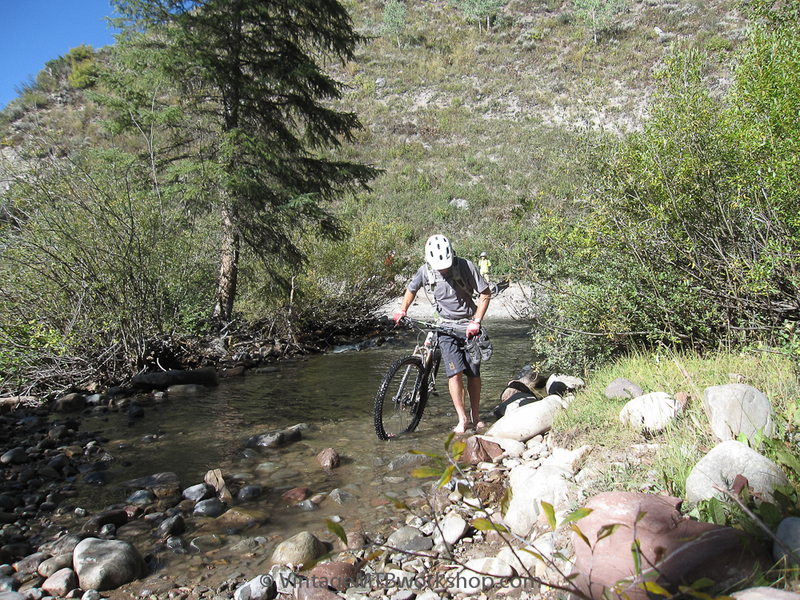 Some attempted to ride through, some walked through, and others took their shoes and socks off and experienced the icy cold water. 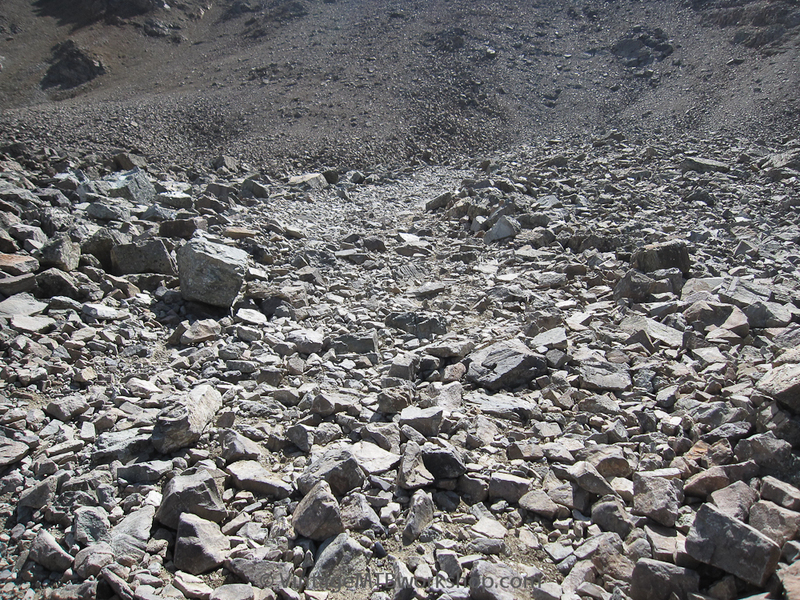 The lowest gear for climbing on the Breezer was 32 teeth in front and 30 out back, making for a challenging day one some of the steeper and rougher pitches. 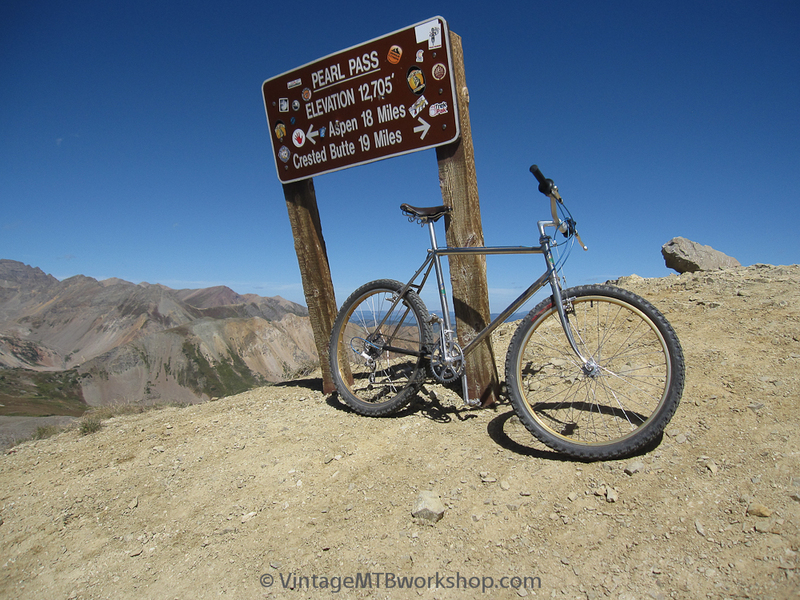 The gearing is probably more appropriate for the steep but smoother climbs found in Marin where the bike was made. This sign marks the split between Middle and East Brush Creek. The classic view of Cumberland Basin, with the back side of Castle Peak off to the right. 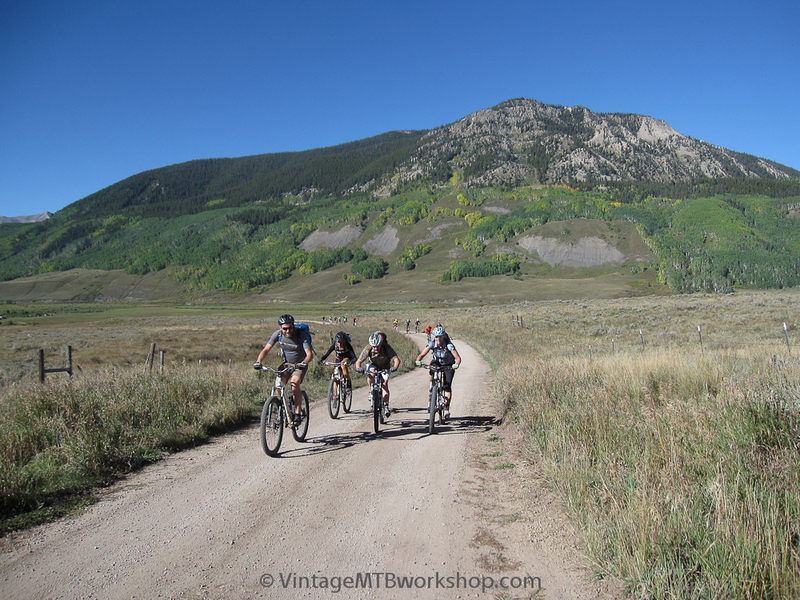 As beautiful as the scenery was, shortly thereafter, everyone resorted to pushing their bike. 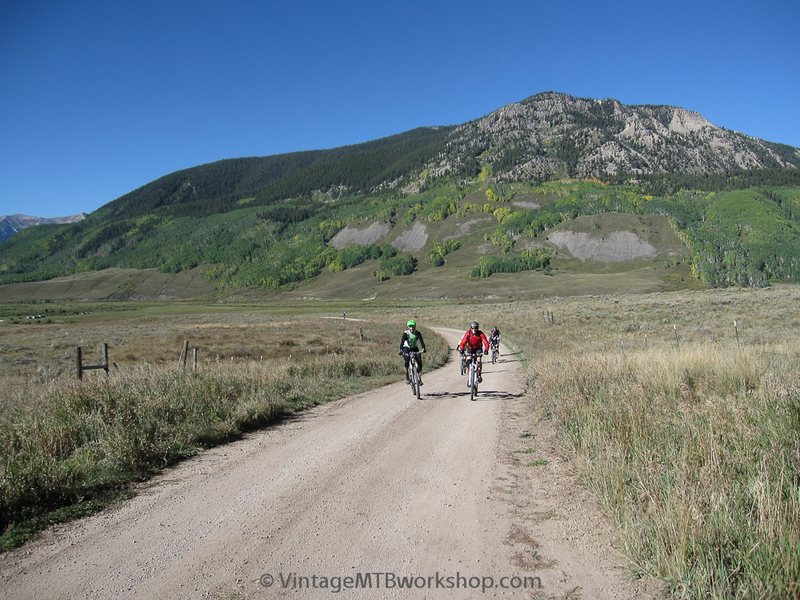 The klunker riders that started out the day before and camped can be seen ahead. 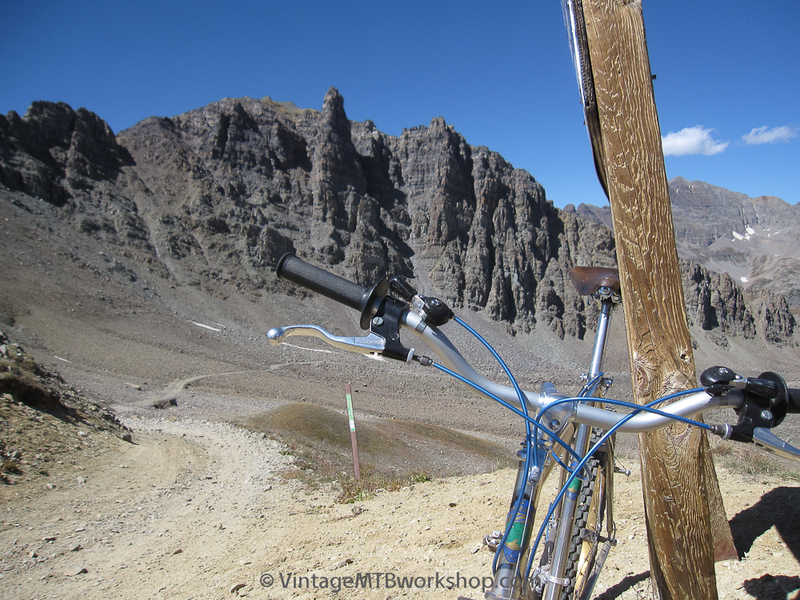 This classic vantage point for taking photos is at the false summit of Pearl Pass. A final loose climb awaits off to the left. 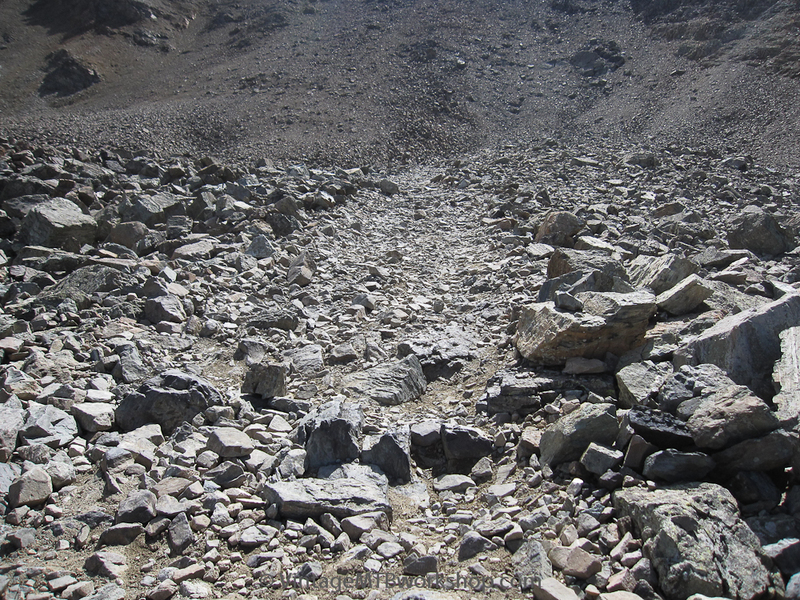 A view down into the East Brush Creek drainage and the location of the Friends Hut. 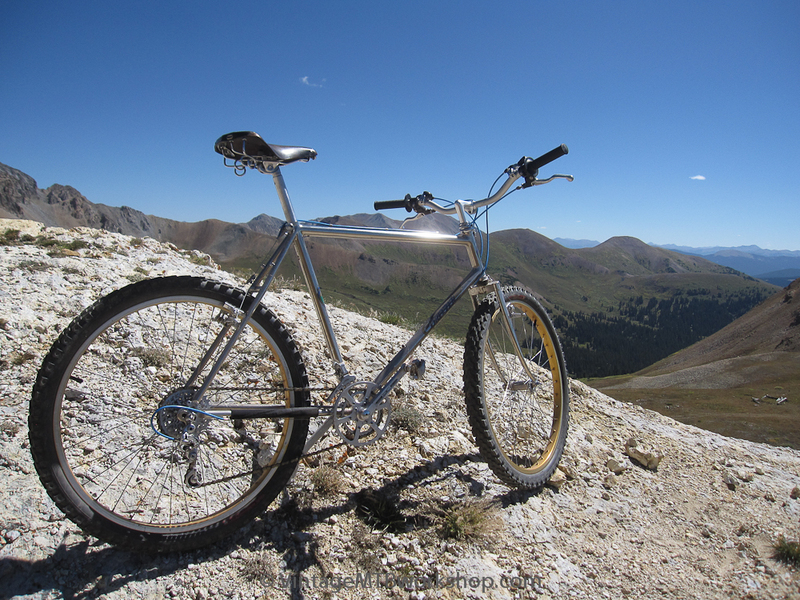 The 1980 Breezer on the summit of Pearl Pass several decades after its first ascent. A look up and down the road on the way down. 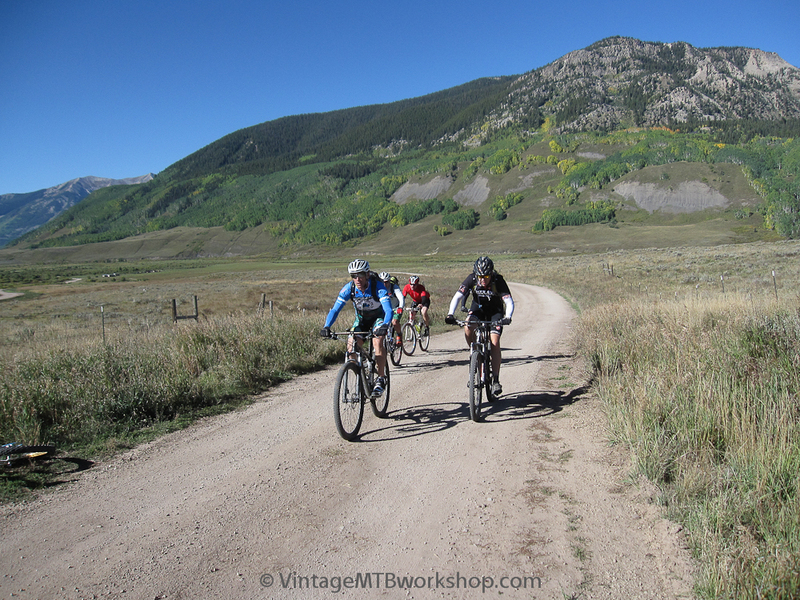 This would even slow down the modern full-suspension bikes on this day. 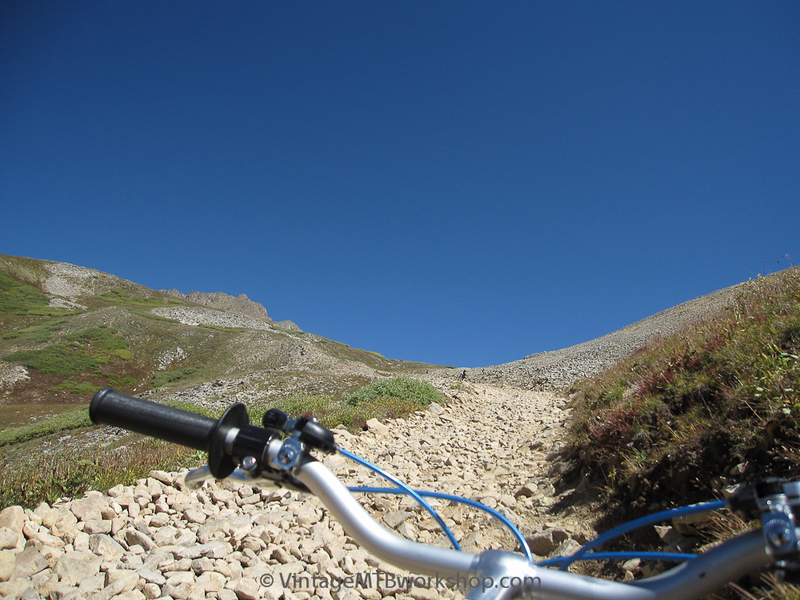 Bigger tires were put on the Breezer with this section of the route in mind. 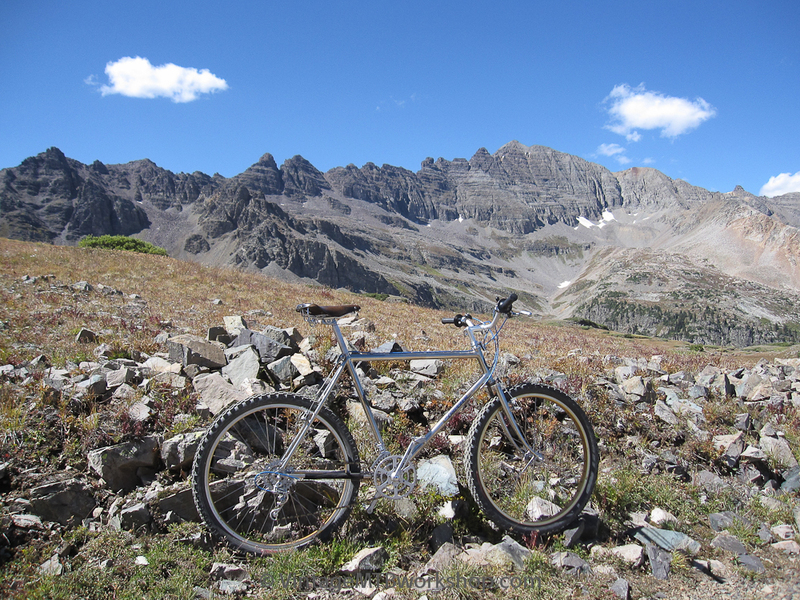 As it turned out, the Breezer proved to be very adept at technical descending and was incredibly stable. 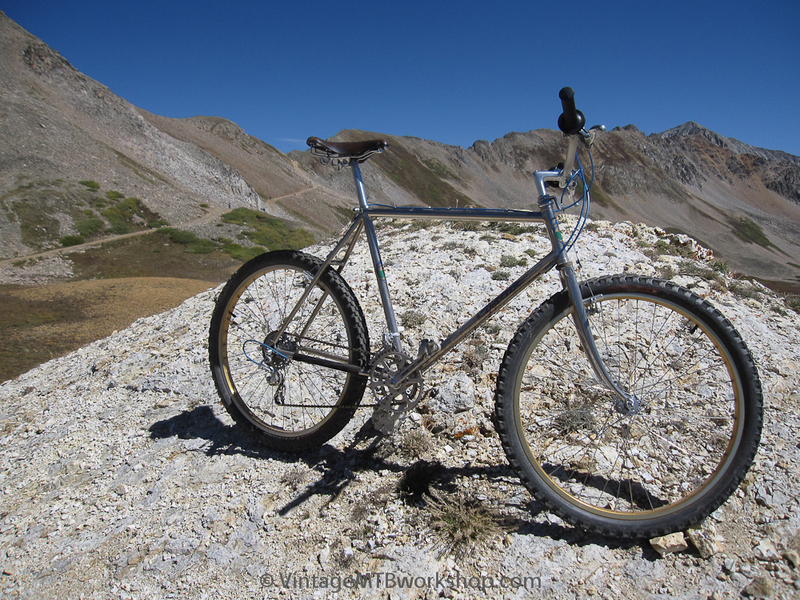 Perhaps there is something to be said for chainstays that are 18.5 inches long and a wheelbase of 44 inches. 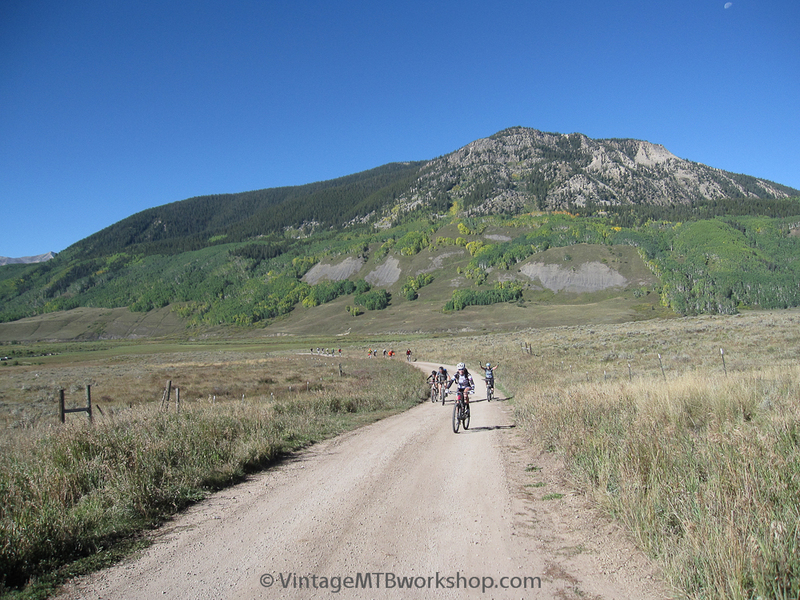 An expansive view of Castle Peak from the Aspen side. 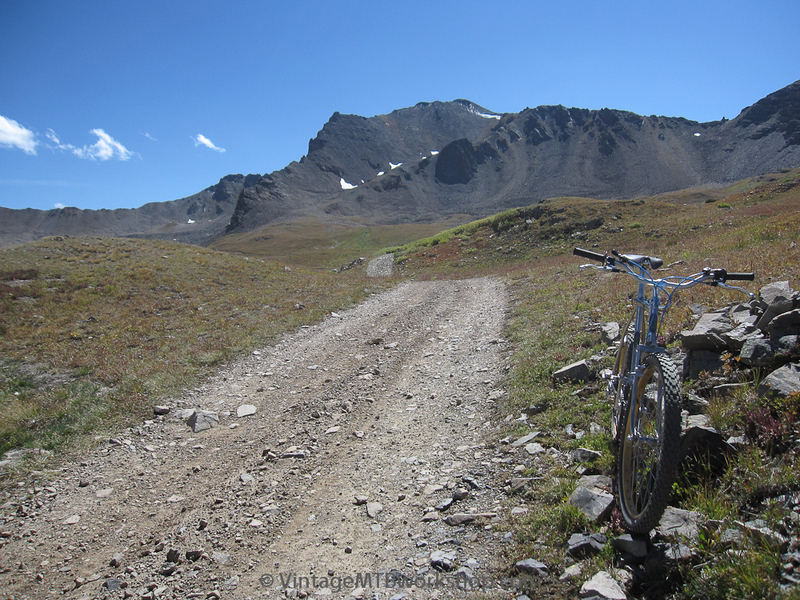 A look back at Pearl Pass, with a road surface that is actually smooth in some spots. 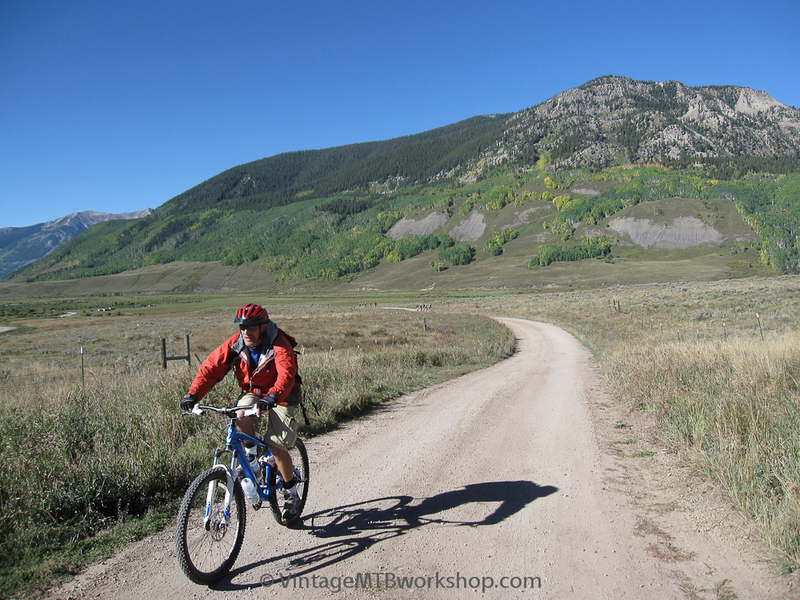 Fall colors were beginning to show down in the Castle Creek valley. 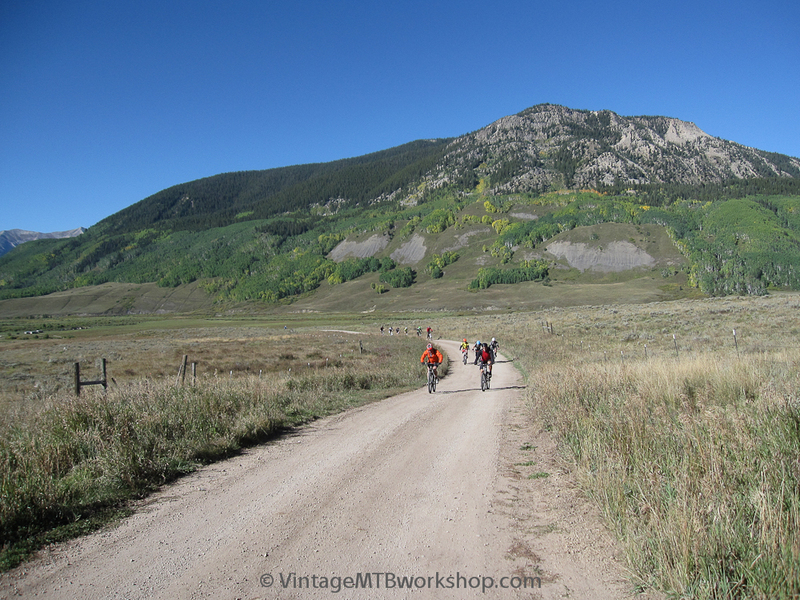 A classic Colorado view, looking back up the valley to the big mountains above tree line. 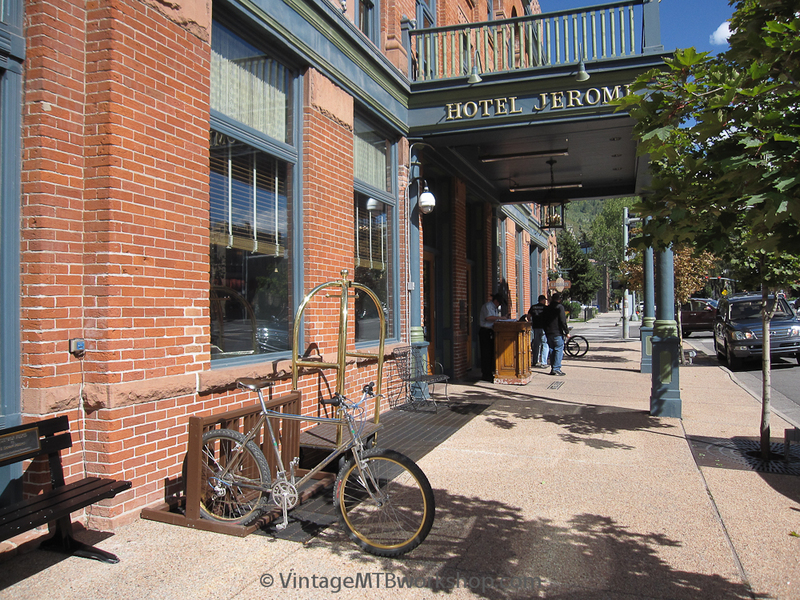 The traditional end to the Pearl Pass Tour is the Hotel Jerome, where in the past the Crested Butte riders would make a little noise to let the Aspen locals know that they had arrived. It was quiet on this day. 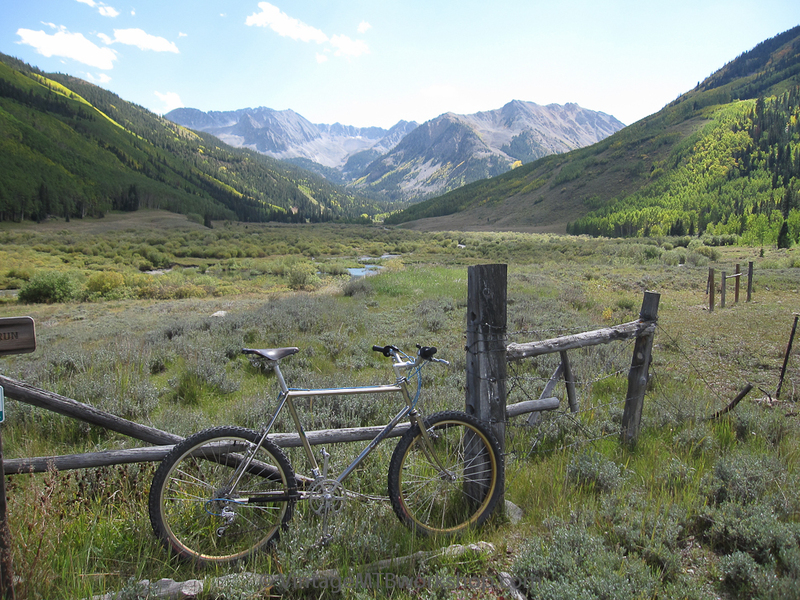 With much relief, the Breezer completed the trip from Crested Butte to Aspen without incident. 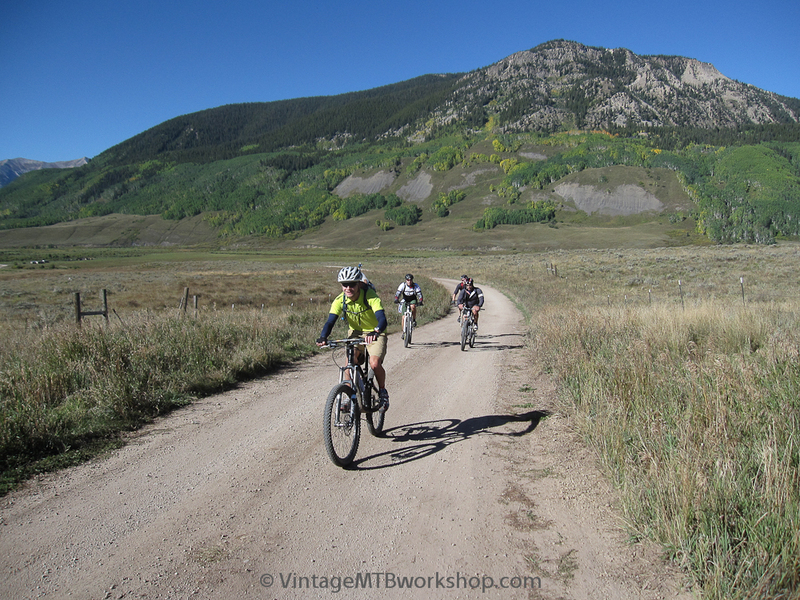 However, with some concern for the steep climb on Express Creek Road to Taylor Pass and the demanding descent down East Brush Creek, the Breezer was returned to Crested Butte via shuttle and the return trip was completed on a modern bike. Looking ahead, it is hard to imagine topping the significance of riding this bike on Pearl with a different historic bike in a subsequent edition of the event.